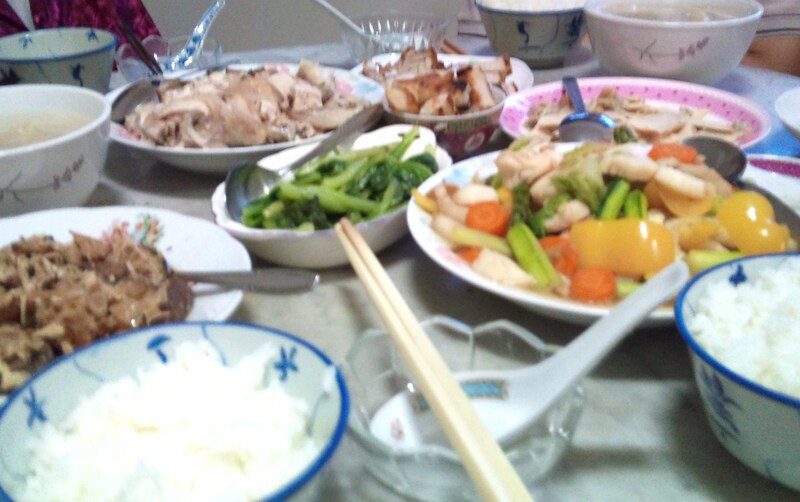 To end every year of the Chinese calendar, I participate in two family re-unions. Reason: I have 7 brothers with whom I share the same father and one sister with whom I share both parents. After my grandfather passed away in 1986, my father for reasons best known to himself initiated the mammoth re-union dinner for the extended family. 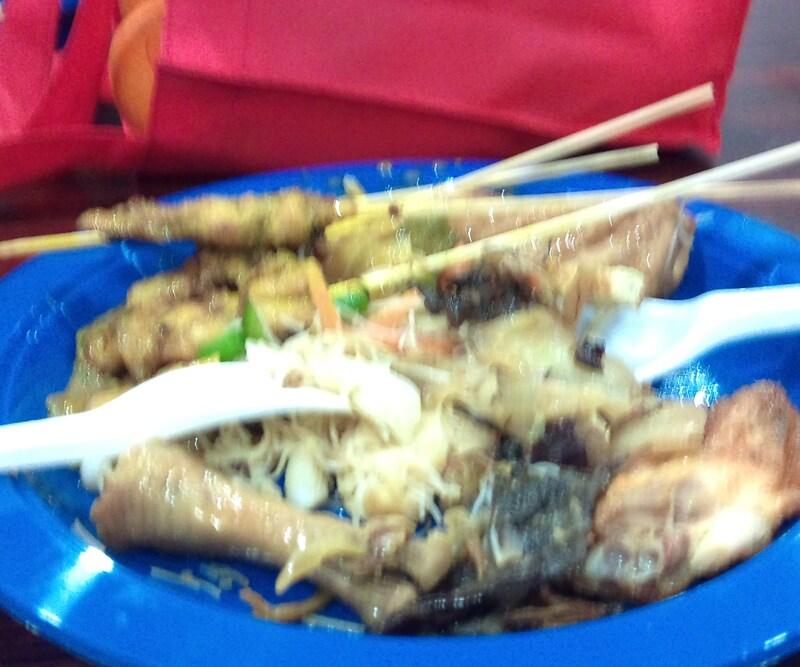 Which was never on Chinese New Year eve itself but on a night close enough. That’s a nod to the fact that majority of the extended family members already have families and in-laws of their own and their priorities for New Year’s eve might not co-incide with the minority. The reunion dinners with Dad were always in a vegetarian restaurant — mostly at Kingsland (now gone with the wind as has the complex where it once was — Albert Complex, now renamed OG) but occasionally there were deviations, such as once in Coronation Plaza This was because Dad was a full-blown vegetarian. When he left us in 2001, the extended family wanted to carry on with the reunion dinners, tho with one important change. We forsook vegetarian restaurants: we went from buffet outlets (eg Princess Terrace) to sit-down fare at Old Hongkong one year and Zhou’s Kitchen another year, both at Novena Square. We might have gone to another restaurant for the latest mammoth reunion but as there were easily 50 of us, even when the full complement is never present, someone thought a potluck at a condo club house might be more economical and relaxed especially now that the extended family includes some restless early primary school kids who are less easy to restrain that babes in arm! So there we were on Saturday night (Jan 21) at a condo (where No 1 nephew lives) on Dunearn Road with a satay man working overtime to feed the hungry mouths. In addition, there were home fried beehoon Putien style (we are more or less Putienese), chicken wings from Ikea, brocoli and cauliflower vegetarian dish, tofu vegetarian dish, vegetarian fried rice, vegetarian vegetable curry, tradional Cantonese “chai”, Peking duck, pizzas, whole soy sauce chicken from Chinatown, home made Drambuie fruit cake, papaya, Jeyu grapes, white nectarine, bean curd gingko nut soup and Belgian chocolates. Alas, I overlooked to take any pictures of the ecclectic spread but managed too late to take one of what I was eating in my third round, as I listened to my oldest brother explain why he’s still nostalgic for Singapore. I postulated that it’s because he and wife live with their daughter and family Down Under. Shorthand? Family makes for home and reduces home-sickness when away from Singapore. I looked around the room as those who share my bloodline or are related to me through marriage cluster in small groups bonding over food and catching up. Two nephews have relocated from the Middle East; one after 5 years in Egypt; another after 3 years in Qatar. Another absent nephew has worked in Kuala Lumpur longer than he has worked in Singapore. There’s a brother who is almost a China permanent resident having been there since the early 1980s, not to live but on short stints that lasted several months a time in places like Shanghai, Beijing and Chengdu — till more recently when one factory he’s overseeing in Xian is finally done and he like all of us are getting on in age and prefer the bubble of S’pore to the wide expanse of the world. His daughter, however, has globe-trotted for one year even be4 she had completed her tertiary education, calling many parts of the US and parts of Italy her temporary home. Yet another brother makes such regular and extended trips to Shanghai shepherding his Singapore students to a twin school there that he feels quite an expert on the former “Paree of the East” :lol:! I wonder how many of my nieces and nephews and their offspring — or even my younger siblings– would feel like my oldest brother feels: nowhere in the world other than Singapore feels like home? After all, unlike us — ie their parents and/or grand-parents — the wider world would be where their own family would be scattered as more and more places would be accessible to Singapore and Singapore to those places. Not sure if this is exhilirating or plain depressing, especially when I consider that after many, many house moves I too have settled in one place for gasp-gasp (!!) 22 years! Have I grown roots or have I just become moribund? After my shock parting with my fav necklace (from Bangkok, gift of C who has generously promised to get me another one, without saying that I should have accepted all three sets that were bought for me in the first place! ), I thought that was that. But remember, I managed to rescue a few pieces from falling to the toilet floor of the Tian Jin restaurant in Bras Basah Complex plus the wire and the clasp that held all the dangle-pieces together. So I passed what I rescued to Daffy who is rather deft with assembling bits and pieces together into very passable and price-assessible jewellery. And voila, when I returned home after lunch today I found that she had dropped the re-incarnated necklace on the sideboard. I’m glad to say that the loss of a few dangle-pieces doesn’t seem to have harmed the design. 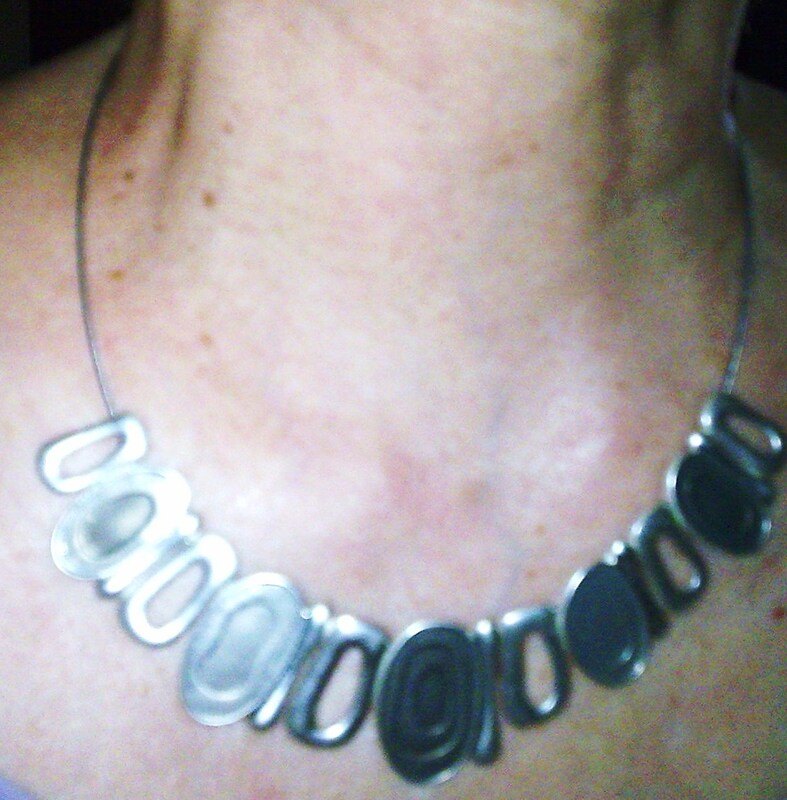 Indeed, the necklace is lighter and more friendly to my neck. 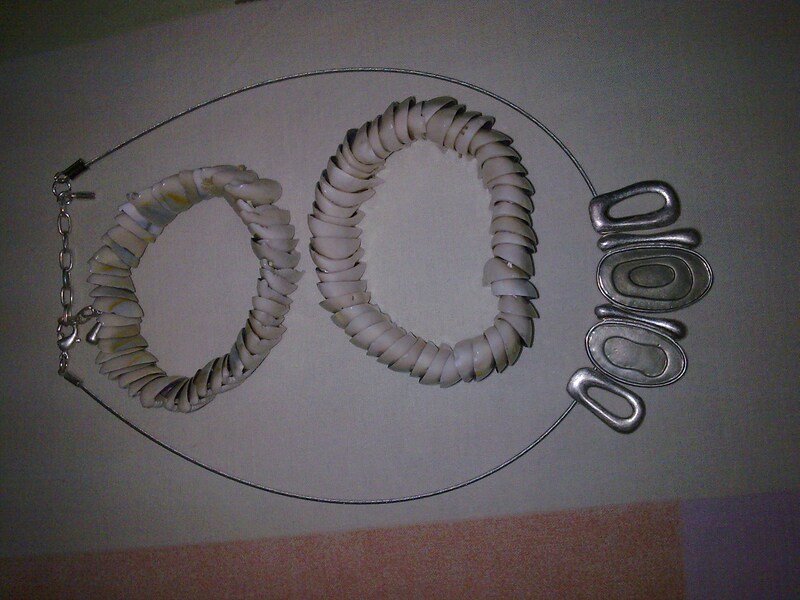 Which incidentally brings me to my fav bracelet made from pieces of shell from Chengdu, that could be worn two ways, or reversible. It was given to me after a visit to an erstwhile friend with whom I stayed in Shanghai in 2006. A twin of the bracelet was presented by this erstwhile friend to LW who had gone along with me for the visit. LW who prefers diamonds and all the usual blings was less enamoured of the gift than I was and still am. So not surprisingly, when doing spring cleaning recently and coming across the hardly worn bracelet she decided to pass it to me, “since you seem to like these things”. I do, I do. Now, I can wear the bracelet singly, together on one wrist, separate — one on each wrist. As the bracelets are reversible, the permutations are many. Pity that the person who gave me the first bracelet has decided to be mad with me and deleted me from all memory! I continue to wear the bracelets not as reminders of a good friendship gone sour but heck, because I really, really like them. U see, I’m the orginal lemonade girl. When life hands you a lemon, such as seeing your fav necklace snap and most of the dangly pieces on the public toilet floor, you make lemande. Not only that, you add a dash of Absolut vodka and some honey :-D!